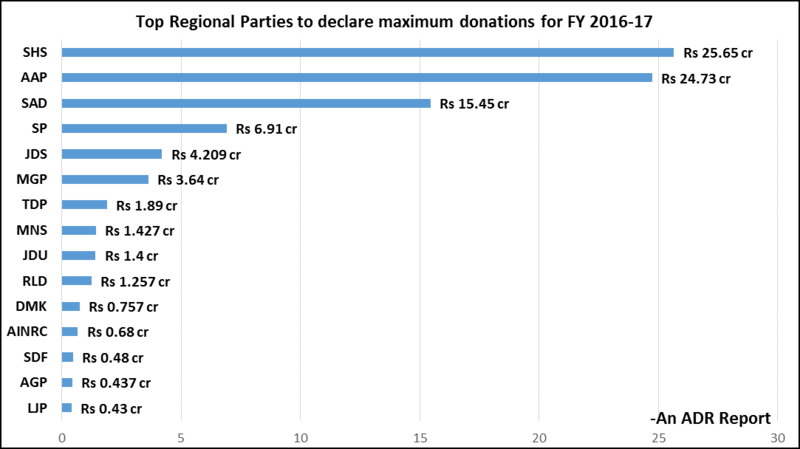 This report, prepared by Association for Democratic Reforms (ADR) focuses on donations declared by Regional Political Parties, during the Financial Year 2016-17, as submitted by the parties to the Election Commission of India (ECI). Details of sources of income of Regional Parties and sector-wise donations (from known sources) will be released on 9th Aug, 2018. Under Section 29C(1) of the Representation of People’s Act, 1951, political parties are required to prepare a report providing details of contributions in excess of twenty thousand rupees from any person in a particular financial year to avail 100% tax exemption. However, in FY 2016-17, we see that 7 Regional Parties (SAD, MGP, DMK, AINRC, AGP, NPF and DMDK) have also provided details of donations received below Rs 20,000 in their contributions report. The total amount of donations declared by Regional Parties, including both above and below Rs 20,000, was Rs 91.37 cr, from 6339 donations. With regard to the total amount of donations, Shiv Sena leads with Rs 25.65 cr from 297 donations followed by AAP, which has declared receiving Rs 24.73 cr from 3865 donations. SAD declared receiving Rs 15.45 cr that is the third highest amongst all regional parties. 72.05% or Rs 65.83 cr of the total donations received by Regional Parties have been received solely by top three Regional Parties. AGP, SAD, JDS, MNS and AAP saw the maximum percentage increase in their income from donations between FY 2015-16 and 2016-17. Donations to AGP increased by 7183%, followed by SAD for which it was 5842%, and JDS that saw an increase of 596%. Amongst the top five parties, only Shiv Sena saw a decline in the donations received from FY 2015-16. The donations that it had received in FY 2015-16, declined by 70% or Rs 61.19 cr in FY 2016-17. ECI notification dated 29th August, ’14 stated that “…no tax deduction shall be allowed on the contributions made in cash by any person or company to a political party”. 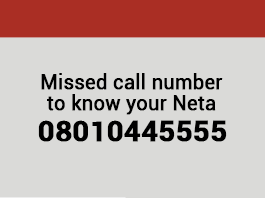 This notification was applicable for donations made from FY 2014-15 onwards. But, the Regional Parties have declared receiving Rs 2.82 cr via donations in cash. Out of the total donations of Rs 91.37 cr declared by the Regional Parties, Rs 2.82 cr from 1919 donations was received in cash during FY 2016-17. This formed 3.09% of the total donations to the parties. Maximum donations in cash was declared by AINRC, which collected a total of Rs 65 lakhs, followed by AGP with Rs 41.2 lakhs and NPF with Rs 41 lakhs. Among all the states, donors from Assam made the highest donations of Rs 72.7 lakhs in cash followed by donors from Puducherry who donated a total of Rs 65.3 lakhs in cash. Segregation of donations according to location was made by ADR based on the addresses provided by the parties in their donations report to the ECI. Donations declared by the Regional Parties contained details of donations received from 29 States/Union Territories/common capitals and 27 countries according to the declared address of donors. Only AAP declared donations from abroad. Regional parties have declared receiving the highest amount of money or Rs 20.86 cr from Delhi, followed by Rs 19.7 cr from Maharashtra and Rs 9.42 cr from Punjab. A total of Rs 14.38 cr, (15.74% of total donations received by the Regional parties, FY 2016-17), could not be attributed to any State/Union Territory due to incomplete or lack of information provided by the parties. Out of 25 Regional Parties who had declared receiving donations, 18 parties, have declared donations of donors without their PAN details. Rs 23.08 cr or 25.26% of the total amount of donations received by Regional Parties do not have PAN details. It is to be noted that parties like BPF, MGP, PMK, RJD and ZNP who have declared 100 percent donations, have not provided PAN details of even a single donor in their donations statement. It is seen that AAP declared receiving Rs 8.82 cr from abroad out of which PAN details are not available for donations amounting to Rs 8.32 cr. Parties not adhering to the deadline fixed by the Election Commission of India should be penalized by making them liable to pay tax on 100% of their income from various sources. The National and Regional political parties must provide all information on their finances under the Right to Information Act. This will go a long way in strengthening political parties, elections and democracy.